Life cycle: Corn Earworm produces up to seven generations each year. The pupae overwinters in the soil. Physical Description: This 1 1/2 inch long caterpillar varies in color from white to green to red with four pairs of prolegs. The adult moth is gray or brown with black markings on the fore wings, and flies at night with a wingspan of 1 1/2 inches. The domed shaped, ridged eggs are a light brown or yellow and are laid singly on the leaves of host plants. Feeding characteristics: Corn Earworm attacks bean, corn, pea, pepper, potato, squash, and tomato plants, chewing buds and eating ragged patches out of tender, unfolding leaves, causing plants to be stunted. 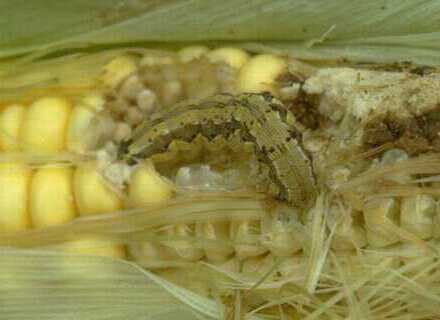 The most serious damage occurs later, when the larvae attack the ears corn. They first eat the silky tassels, then turn to the kernels, starting at the tip. They leave behind moist castings, and hinder or prevent pollination. Mold forms and the kernels are prone to several diseases. On the tomato plant, the larvae enter the stem end. The larvae will chew foliage of several other crops. Controls: The Tachinid Flies is a natural predator that can be helpful. Timed planting may also sidestep the pest. In the South, early and late plantings are most vulnerable, where in the North, the borer hit early and the earworm hit late. Worms are most numerous two weeks after a full moon, because of increased mating during the full moon. Therefore, corn should silk during a full moon. also for corn, you can apply a drop a mix of pyrethrum and mineral oil inside the tip of each ear after the silk has wilted, smothering the worms. The oil is tasteless and will not affect the flavor. However, oil may spoil ears in hot, dry weather. A natural insecticide ryania is quite effective against this pest. The adult moth is attracted to Blacklight traps. Soldier beetle larvae enter the pest's tunnel and eat the worm. Other insects that prey on earworms are the black flower bug, green lacewing, and damsel bug. Blackbirds, grackles, English sparrows, and woodpeckers eat larvae, but may damage ears in the process. Trichogramma Wasps parasitize earworm eggs. Releases of the wasp can be complemented by dusting with the bacterial pathogen Bacillus thuringiensis. The earworm is also controlled by Elcar, a viral insecticide.